OLIVIER / Zoomlion Concrete Mixing plant of the new generation with a mixing volume of 180m³/h. HZS series of concrete mixing plant are designed and improved on the basis of rich research experience of Zoomlion, assimilating advanced technology and scientific research achievements from worldwide industry leaders. 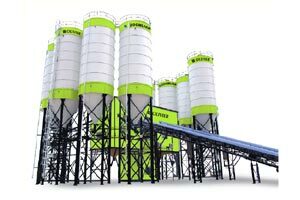 The newly developed high performance concrete mixing plant features a modular structure design, which ensures a compact and practical structure, reasonable layout, easy installation and convenient transportation.